David and I have been watching some documentaries about Japan (check Japanology on Youtube), and we like trying some Japanese food while we're at it. This time it was miso soup, a big bowlful of Japanese comfort food that is super quick to make. The miso (fermented soy paste) makes for a lovely creamy broth with a savory and subtly sweet flavor. 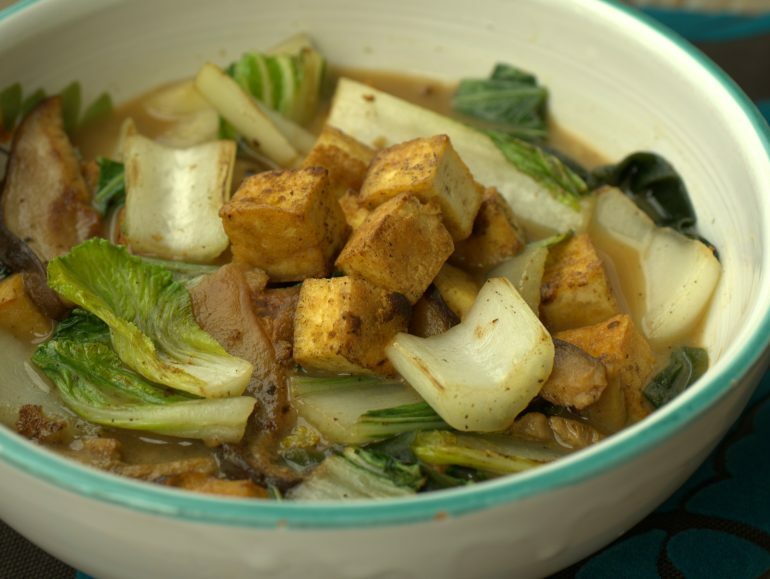 This version has tofu, mushrooms and bok choy, but feel free to add some low carb noodles if you like. I used seaweed to replace the bonito/tuna flakes in traditional Japanese dashi broth. This contributes to the savory flavor without making the soup overly fishy. You can buy miso paste and wakame seaweed at an Asian grocery or health food store. Make sure to get shiro miso, also known as white miso, because that's the one with a nice mild flavor. The miso is not really white, but rather light brown. Bring the water to a boil in a deep pot. Add the shiitakes and let them soak for a minute. Remove the shiitakes with a slotted spoon, press out the excess liquid and set them aside. Dissolve the miso in the hot water and add the seaweed flakes. Fry the tofu in some oil until it is golden brown. Add the garlic and ginger and let it cook for a few seconds. Now add the soaked shiitakes and the bok choy and continue to stir fry for a few more minutes until the boy choy looses it's bitter flavor and is tender, but nog soggy. Divide the miso broth over two large bowls. Add the tofu vegetable mixture and garnish with the optional sesame seeds and sesame oil. Hi Christina, I'm sorry, I often eyeball stuff and can't be very specific when I do. I think a loosely filled cup of shiitakes will do. Adjust to your own taste and what looks good to you.